We grew iceberg lettuce for the first time, at Maggie’s urging. She’s the boss of the lettuce patch, so we generally go along with whatever she wants. At least with lettuce. Iceberg seems an odd choice for a farm like ours, doesn’t it? We enjoy growing varied, interesting lettuce varieties. I quizzed Maggie why she was eager to grow iceberg. “You know, everyone secretly loves iceberg lettuce,” she said, then described breaking down in winter and buying iceberg when all our leafy greens are done for the year. It’s just an experiment for us this season. Turned out pretty well, a challenge this time of year when the weather is wet and warm. As an experiment, it’s a small planting so we have iceberg for most members but some members will get red bibb or red leaf lettuce instead. The weather has been lovely this week, a real treat. Why do we take the leaves off our carrots? It’s common to find bunched carrots with tops for sale at farmers’ markets. They are pretty but keeping the tops on is a bad idea! The leaves pull moisture out of the carrot roots, drying them out. We remove the carrot tops at harvest so the roots stay sweet and crisp. Beth and Steve, did you bottle the tomato juice yourselves? No, no, no. That would be quite a project, wouldn’t it? We had the juice bottled last year at peak season by a small food processor called Contract Comestibles in East Troy, WI. We are well-sized for each other. Many food processors would consider a batch of 500 jars of juice too small to mess with. They’ve done a nice job for us the last two years. We plan to bottle juice again this year (for next year’s CSA boxes) as long as we have a big flush of tomatoes at peak season. Should we return the empty juice jars? Please keep the jars or recycle them. We cannot re-use them for juice. Please do not return them to us – we don’t want to risk shattered glass at the pickup sites. Next week’s box will probably contain Swiss chard, cucumbers, tomatoes, onions, zucchini, cucumbers, herbs and more. Caraflex cabbage – This is a return of the pointy cabbage we delivered three weeks ago. We’ve chosen this variety for summer production because the leaves are tender and perfect for raw slaws and salads. 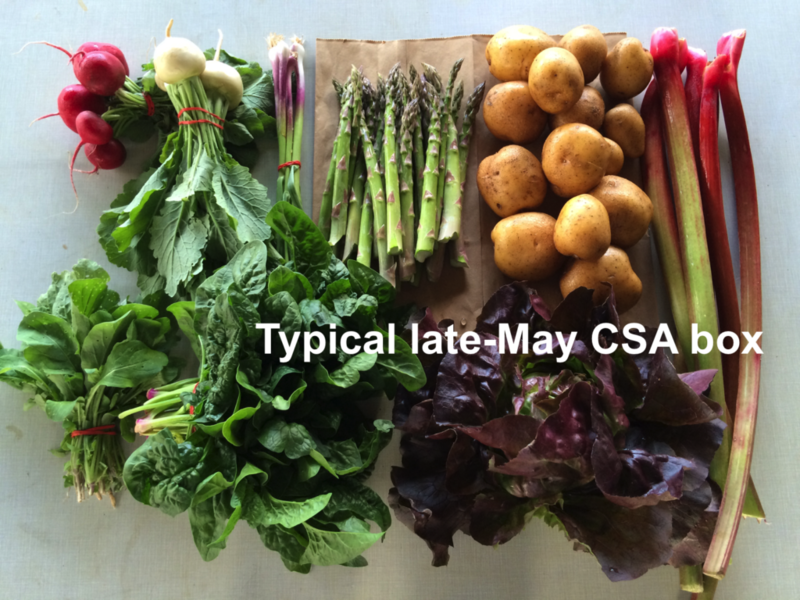 The small size is helpful this time of year when we have so many other options for the CSA box. Fresh garlic – Here’s a treat. Harvested fresh this week and sent to you without drying the skins, this garlic is super crunchy and tasty. Eat soon before the skins dry for the easiest peeling. Now we will harvest the rest of the garlic field but will need to wait while the skins dry before we can deliver garlic again. Carrots – First carrot harvest of the year! Tomatoes – Tomato harvests have just begun. Soon we will be swimming in tomatoes. Everyone gets cherry tomatoes OR slicing tomato(es) plus a green bell pepper. Cucumbers – This week, we have small amounts of pickles and a white cucumber called ‘Silver Slicer’ which is interesting and tasty. We don’t have enough for everyone this week, but we will try to distribute them to all the sites over the next few weeks. You will receive 2 slicing cucumbers OR a Silver Slicer and a small amount of pickles. Don’t worry about pickling the pickles. They are excellent for salads because of their thin, tender skins. That’s what we choose for salads. Don’t peel the pickles or the Silver Slicers; it’s unnecessary. We will pack for you at least one of these types: slicing cucumbers (top), ‘Silver Slicer’ cucumbers (middle) or pickles (bottom). Bring a large pot of water to boil on the stove. Blanche (submerge in boiling water) beans for three minutes. Remove from water and cover with ice cubes or place hot beans in an ice bath to stop the cooking immediately. This will help keep their crispness. Blanche the snap peas for 1 minute, if using. Remove to an ice bath or cover with ice cubes. Strain the beans and peas in a colander and shake a few times to make sure most of the water is removed. Prepare the pesto by pulsing garlic and almonds in a food processor until very fine. Add cilantro. Pulse until the mixture resembles a course meal. Add lemon juice, salt, red pepper flakes and pepper. Turn the food processor on and slowly add the olive oil. You may need to scrape down the sides of the food processor occasionally. Add 1/4 cup of cilantro pesto to the cooled and dried beans and peas. Save the rest in the fridge for some other use. Add more salt and/or red pepper flakes to taste. Enjoy!